The truth is, however, that the administration has made very little serious effort to advance what has been one of the president’s favorite talking points over the past few years. This week, American Oversight released its “Audit the Wall” report, which details the administration’s lack of legal and financial preparations for carrying out what would be a massive infrastructure project. In its “Walls Work” press release, which was updated on Thursday, DHS points to the construction of multiple segments of the wall as evidence of its having begun “construction of border wall exceptionally quickly.” But as our report notes, that construction largely involved replacing existing fencing, and drew upon previous years’ funding. Two miles of new fencing in Southern California, which the administration claimed in October were the first two miles of the new border wall, had actually been planned since 2009 — a fact DHS did not note in its Wednesday release. Not only has the president failed to secure any funding for his project, the administration has also failed to take a number of critical steps, from making legal preparations for taking private land to engaging with Native Americans who control large portions of the border land, to assessing the irreversible damage that building such a wall would have on the environment. “The president is threatening to shut down the government over funding for a project that isn’t shovel-ready,” said American Oversight Executive Director Austin Evers. Our report makes clear that Trump’s border-wall claims and demands are little more than a base-placating rhetorical tool — not serious policy. 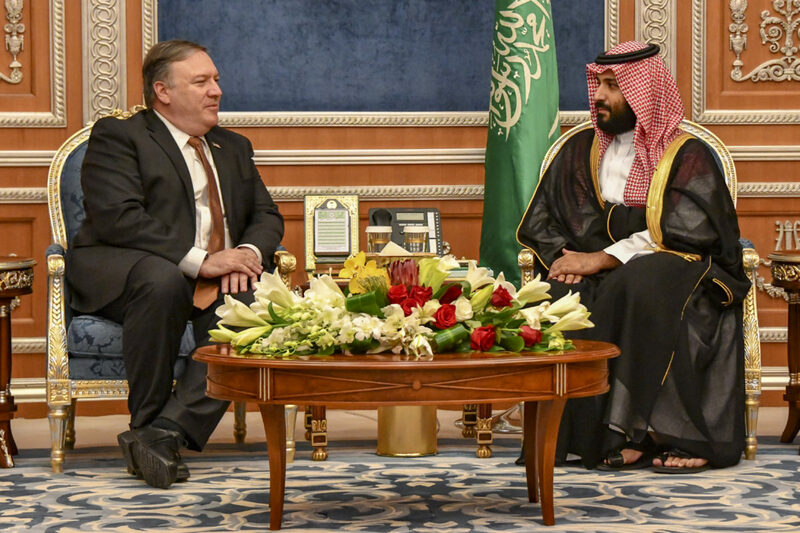 On Thursday, the Senate voted to withdraw U.S. military support for Saudi Arabia’s war in Yemen and unanimously approving a resolution naming Crown Prince Mohammed bin Salman as personally responsible for the murder of journalist Jamal Khashoggi. American Oversight is investigating the government’s response to Khashoggi’s murder and whether it were influenced by Saudi lobbying efforts. The incoming chair of the House Foreign Affairs Committee, Rep. Eliot Engel, also plans to investigate Saudi Arabia’s influence. Today, American Oversight filed Freedom of Information Act requests with the Departments of Justice and Homeland Security, seeking information on whether the November midterm elections influenced the administration’s response to the mass shooting at a Pittsburgh synagogue or to the news of bombs being sent to multiple Trump critics. Both events happened less than two weeks before Election Day, and Trump blamed them for Republicans’ loss of “tremendous momentum.” We’re asking for any talking points DHS or DOJ prepared or received from the White House regarding the pipe bombs and the Pittsburgh attack. The Trump administration’s rejection of world climate efforts and its embrace of fossil fuels was on full display in Poland earlier this week, when a White House adviser on energy and climate was laughed at during a presentation. The adviser, Wells Griffith, has no experience in energy — we have his resume. The incoming Congress continues to shed light on its oversight priorities for 2019. Rep. Elijah Cummings, the likely next chair of the House Oversight Committee, said that he plans to investigate the decision to include a citizenship question on the 2020 census. We filed a lawsuit with the NAACP in October for records about the Justice Department’s involvement in that decision. And Politico reports that multiple committees are poised to look into Education Secretary Betsy DeVos “over a range of issues such as her rollback of regulations aimed at predatory for-profit colleges, the stalled processing of student loan forgiveness and a rewrite of campus sexual assault policies.” American Oversight has been and will continue to be investigating those issues, among others, at the Department of Education. The Consumer Financial Protection Bureau finally released a suppressed report on the dubious high fees many banks charge college students, possibly in violation of Department of Education rules. Multiple groups, including American Oversight, had requested its release after a CFPB official alluded to its suppression in his resignation letter, which included heavy criticism of the CFPB’s leadership under then–Acting Director Mick Mulvaney. And, of course, more emails.